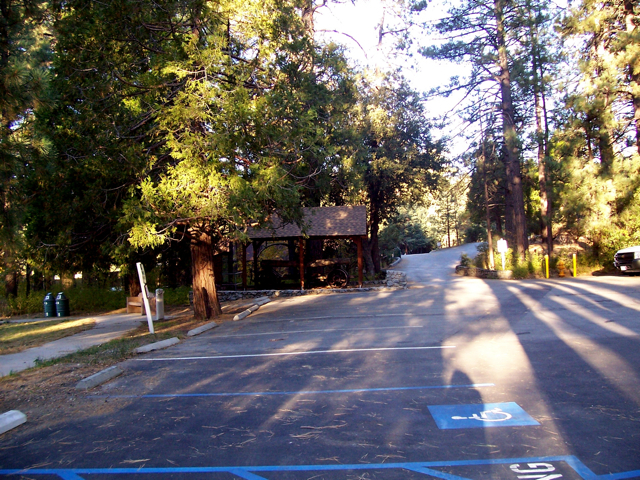 In any given month in Idyllwild, CA, hundreds of squirrels run across Highway 243 and side streets and get hit. Locals know to honk their horns, and the squirrels will run back quickly. Their “stop and go” tactics might be able to divert natural predators, but they are no match for fast-moving cars and inattentive drivers. So when I saw the car in front of me, hit a squirrel I was hopeful when I drove by and saw that its head was still up. When squirrels die, they usually lie on their back or sides. Was it still alive? I quickly pulled over and picked up a small basket from the back seat of my car, and a magazine. When I got to him, he was breathing heavily, but still alive. His back legs looked a little twisted, but otherwise he was OK. So I pushed him a little bit with the magazine to see if he would run off, but he winced in pain. By this point, I realized that I was blocking traffic. It was 25 feet from a stop sign on Hwy. 243, so cars were slowing down naturally, but I was standing in the middle of the road. So when a friend of my boyfriend’s, drove up and asked nicely what was going on, I told her my intentions. “So then get it out of the road,” she said, and I scooped him up without looking. He didn’t fight or try to run away. I think he was still dazed and likely in pain. Just then, several young hikers walked by, and said that it was really cool at what I was doing, saving the squirrel and all. I was starting to get embarrassed about the whole affair. I put the squirrel in the basket on the floor of the front seat and drove home about a mile away. He didn’t like the car’s motion, and crawled up under the dashboard. I was nervous that he might jump around or bite me in a panic, so I kept talking to him like I do my cats. “Don’t worry, baby, everything’s going to be alright,” I cooed. Speaking of cats, I have four of them, and I’m bringing a wounded squirrel home! They would dance on my head all night long if I brought him inside the bathroom. Jeff, my boyfriend, suggested that I call Barbara Hunt to see if she’d take him off my hands. Her husband, Bud, answered the phone and said that she already had too many animals to take care of. “So what should I do with the squirrel?” I asked, hoping for a few squirrel tips. My heart was racing. It was already dark and a wounded squirrel would be easy prey for a coyote. I decided he needed more time to rest. Ever since I was young, I believed that I had a “gift” for saving the world. 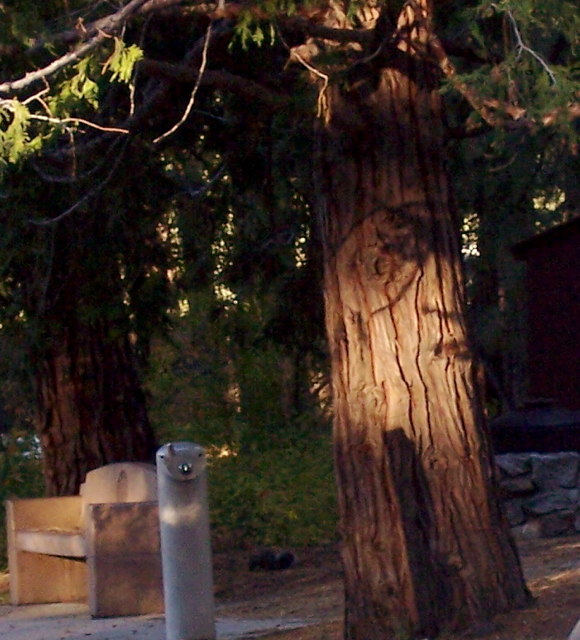 His friend, Richard, who retired from the Idyllwild Post Office, gave me lots of peanuts and other squirrel food (His wife works for the U.S. Forest Service). He also told many great stories of how they have nursed bluejays, raccoons and even a bobcat back to health. They didn’t bring the bobcat inside, but brought her a medlee of raw chicken, beef and pork for weeks, until she was well enough to hunt on her own. 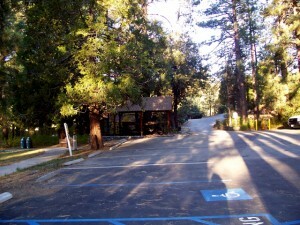 Many people in Idyllwild often go out of their way to help wounded animals. One woman I know has nursed a female coyote back to health, and another guy is nursing two baby raccoons. Seems like everyone in town has at least one story to tell. “When it eats, then you know it’s OK to send him back,” Richard advised. I put the peanuts, a bowl of water and a wool blanket inside the car for the squirrel. I cracked a back window for air and went to bed. After all the drama, I was exhausted. 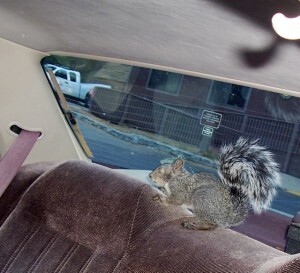 The squirrel was chirping and running around the car, but hadn’t eaten anything all night. 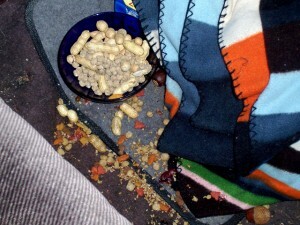 It knocked over the water bowl and left some droppings. But I didn’t take him home that day because he hadn’t eaten. I worked all day, and returned home around 8 p.m. He was sleeping under one of the seats, so I set my alarm for 6 a.m. and prepared to return it to the state park the next day. “That way, he’ll have all day to find its mother and get home,” Jeff said. We were all quickly becoming squirrel experts. The next morning, I witnessed him eating the peanuts and tried to get a few pictures, but he moved too quickly, or my camera was too slow. So I drove to the park. It was a cold, sunny morning, and I had to smile. Growing up, one of my favorite movies was “Born Free.” My heart ached when Elsa was returned to the wild, but nearly starved to death because she didn’t know how to hunt. Although there were no parallels between a lioness and my baby squirrel, I felt a little sad about letting him go. Actually, I decided he was a she, and called her “Cookie,” for being a “tough cookie” and surviving the car accident. I opened up all four doors and waited. Cookie didn’t rush out. So I backed off to give her a little room. Well, after about 15 minutes, I was getting cold and a little bored. So I walked up to the back door and told her that I had things to do. As if on key, she jumped up on the back seat and paused for a second. I grabbed my camera and quickly snapped her picture. Cookie (left of tree) was "Born Free"
As I drove away, I thought about how weird Cookie must feel, spending two nights in a car, and now being back home again. Would she remember me? Tucker, my supervisor at work, thinks so. He lives next door to Barbara Hunt, and friendly squirrels often come to his door. Once, a bluejay landed in his hand. I have to admit, I felt pretty good about giving Cookie another chance. I just hope that other motorists do too, and honk when they see squirrels crossing the road in Idyllwild or anywhere they live.